The WCAG 2.0 accessibility checker is an on-demand page-level tool for checking page content for WCAG 2.0 Level A, AA, and AAA compliance. A list of issues is provided with links to relevant areas on the page and details about the violation, remediation steps, and the specific WCAG guidelines in violation. The checker leverages the Tenon.io accessibility API and is available for Cascade Cloud clients only. 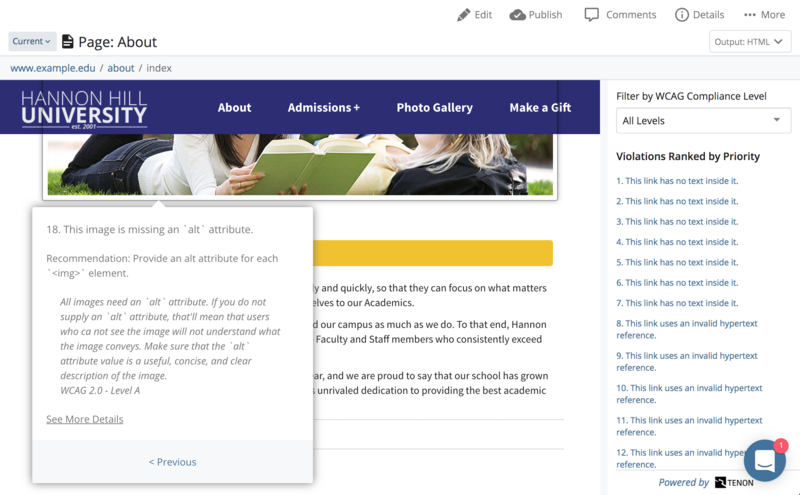 Click the system menu button ( ) > Administration > Accessibility Checking. While viewing a page click More > Check WCAG Compliance. Optionally, filter the list of violations by WCAG Compliance Level.